Many people choose to go to a lawyer to “handle” their divorce because they want to distance themselves from the unhappiness and bitterness they feel. Or because they are so angry that they don’t feel able to speak coherently to the other partner. Both of these situations describe one side of a divorce, the “emotional” side. This is a side that the law (the other “side”) really is not designed to handle. 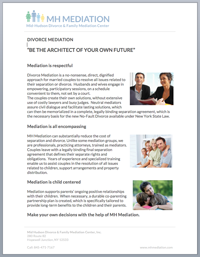 Mediation is the exact opposite of an adversarial litigated divorce. For a start, the couple agree to talk, with the facilitation of a mediator. Then the areas in dispute are systematically examined, both sides air their views and gradually resolution is reached. Once the disputes are settled, the legal documentation is prepared and the couple can proceed to finalize and establish closure. In this very wise article in Huffington Post, Deborah Moskovitch gives her opinion on the real two sides of divorce. In many ways, mediation treads the fine line between both sides and helps the disputing couple come out of the process as successfully as possible.